In the early hours of a Friday in the spring of 1978, two hundred and ten Princeton students piled into Nassau Hall and occupied it for twenty-seven hours. Hundreds of other students, including seniors bucking the pressure of writing their theses, gathered outside the building to chant and demonstrate support for their peers. The university’s board of trustees would be meeting the next day, and the protesting students wanted to put divestment from companies operating in apartheid South Africa on the board’s agenda. While the sit-in did not lead to divestment (that eventually happened in the late 1980s), it raised important questions about the university’s financial ties to human rights abuses and other objectionable practices. Divestment—from companies profiting from Israel’s occupation of the West Bank and from fossil fuel companies—is once again up for debate at universities around the country. On February 17, the undergraduate student senate at Stanford University passed a resolution calling on the university to divest from corporations facilitating human rights abuses in the Occupied Palestinian Territories. Two days later, the student government at Northwestern University passed a resolution calling on the university to divest from six corporations profiting from human rights violations in the Israeli-occupied West Bank. At the beginning of April, Syracuse University announced its decision remove its $1.18 billion endowment from direct investments in fossil fuel companies. Last week at Yale, forty-eight students staged a sit-in urging their university to divest from fossil fuels. Students have staged similar actions at Bowdoin and Swarthmore in the past several weeks. There are noticeable parallels between the student movement for divestment from apartheid South Africa and the divestment campaigns currently sweeping college campuses. Then, like now, the debate about divestment pitted student activists against university administrators. And then, like now, administrators stubbornly refused to acknowledge their ties and their institutions’ ties to corporations and organizations profiting from injustice. A recent op-ed by Princeton President emeritus William G. Bowen, who has re-emerged as an outspoken opponent of divestment, provides an opportunity to revisit the myth of institutional neutrality when it comes to issues of social responsibility. Bowen’s arguments against divestment have not changed in the thirty years since the anti-apartheid movement ended. “Taking an institutional stand on political issues,” Bowen writes in the op-ed published in The Washington Post, “threatens the primary educational mission of the university.” But what Bowen does not consider, and did not consider in 1978, is that the university’s decision to invest in or accept donations from companies implicated in human rights abuses and environmental destruction constitutes taking an institutional stand. Furthermore, given those financial ties, Bowen’s insistence on the importance of maintaining institutional neutrality (or at least the appearance of it) on pressing social and political issues appeared dishonest during the struggle against apartheid. It does not look any better now. The NCR Corporation, on whose board of directors Bowen served, supplied computers to the apartheid regime’s military. At the time, it supplied fourteen percent of all computers in South Africa. NCR, the students’ flyer also noted, was in the process of building a multimillion-dollar complex between Johannesburg and Pretoria. “President Bowen,” anti-apartheid students asked in 1978, “isn’t your joint role as director of NCR and as mediator of University debates on divestiture of South African interests a conflict of interests?” Bowen insisted that it wasn’t. President Bowen was not the only member of the university’s highest echelons with ties to apartheid South Africa. The chairman of Princeton’s Board of Trustees at the time, R. Manning Brown, served as director of several multinationals, including J.P. Stevens (a company infamous for labor rights violations in the 1970s) and J.P. Morgan. Another trustee at the time, Nicholas Katzenbach, served as a director and officer of IBM, which provided computers to the apartheid regime’s police force. Today, it is much more difficult to find financial information about the university’s endowment and trustees. While the university almost certainly invests in companies profiting from Israel’s brutal occupation of the West Bank and from fossil fuel companies’ reckless disregard for the future of the planet, PRINCO’s lack of transparency makes it next to impossible to know the size of those investments. It is easier to find who gives money to the university than it is to find which companies the university invests in. And if the kinds of corporations and groups that donate to Princeton give any indication, it is that the university is just as complicit in state and environmental violence as it was thirty years ago. For example, according to The Million Dollar List, compiled by the Indiana University Lilly Family School of Philanthropy, since 2001, Princeton University has received $26 million from BP America—the U.S. branch of the major oil and gas company that was responsible for the largest accidental marine oil spill in the history of the petroleum industry. Princeton has also received donations from an organization called the Tikvah Fund, which gave Princeton $4.5 million in 2008. The Tikvah Fund is a right-wing philanthropy that sponsors a number of programs in the West Bank, including the Ein Prat religious learning organization, which operates in the settlements of Kfar Adumim and Alon. In his op-ed, Mr. Bowen writes, “my main quarrel with current debates over divestment is that they pay too little attention, if any attention at all, to what I regard as the insidious moral perils of divestment.” For Bowen, those “moral perils” are that divestment would force the university to break donors’ trust, that divestment “can tempt individuals to substitute such ‘easy’ actions for their responsibility to act as citizens,” and that divestment would make it more difficult to address “affordability issues.” But Bowen has nothing to say about the moral perils of failing to cut ties to companies that violate human rights and threaten the quality of life on earth for future generations. By accepting donations from or investing in companies or organizations that contribute—whether directly or indirectly—to human rights violations and environmental degradation, the university takes an institutional stance. To argue, as Bowen does in his op-ed, that “the university should be the home of the critic” but never implement any measures to address their criticism is meaningless. It is a defense of an unjust status quo hiding behind a vague gesture to intellectual honesty. 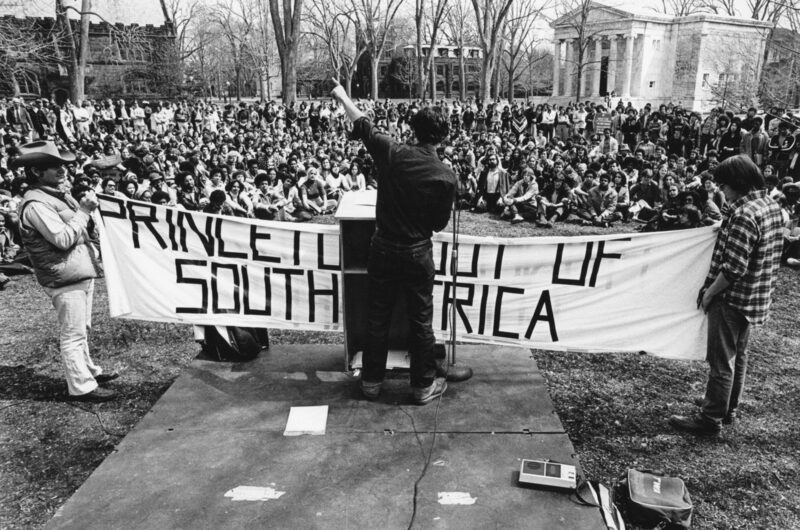 During the campaign to end apartheid in South Africa, President Bowen and university trustees maintained their ties to companies profiting from collaboration with the apartheid regime. Now, as students push for the university to divest from companies facilitating human rights abuses in the Occupied West Bank or environmental degradation around the globe, the university accepts donations from those very companies. Administrators and supporters of maintaining the status quo often try to frame divestment as a move away from institutional neutrality. But Princeton is not, and never has been, neutral. Divestment won’t end the occupation because the occupation is not about money but about security. I doubt Israel will put the life of its citizens in danger because HP stops providing the IDF equipments. This will actually be very disturbing for the 8 millions of jews and muslims living in Israel. Even so, do you think anyone should be profiting off the occupation? Is it morally okay to be profiting off human suffering? This is independent of the fact that many elements of the occupation (most prominently settlements) are blatant land-grabs, illegal under international law, that have no defensive value (and indeed, create more work for the IDF by requiring them to defend these illegal settlements). My point is that no one is profiting from it. We are talking about the West Bank here, 1/10th of NJ in size. It’s such a small market, big corporations couldn’t care less. Israel can’t just withdraw from the West Bank like they did in Gaza in 2005. This won’t happen again, they learned from their mistakes. If you can agree with that, you should be against divestment. There is a reason why Israel is still in the West Bank. If you agree with that, you should be against divestment. It is in fact the position of the international community (including the U.S. govt) that Israel should not still be in the West Bank and if you disagree with that, you are an apologist for colonial land grabs. so should they move out unilaterally, like in gaza? negotiate with a partner who has no mandate? give the land to a terrorist organization that all but the most willfully naive can recognize has Israel’s (and Jewry’s?) destruction as a core component of its existence? my guess is most paths, even executed with care, lead to something like the third possibility.